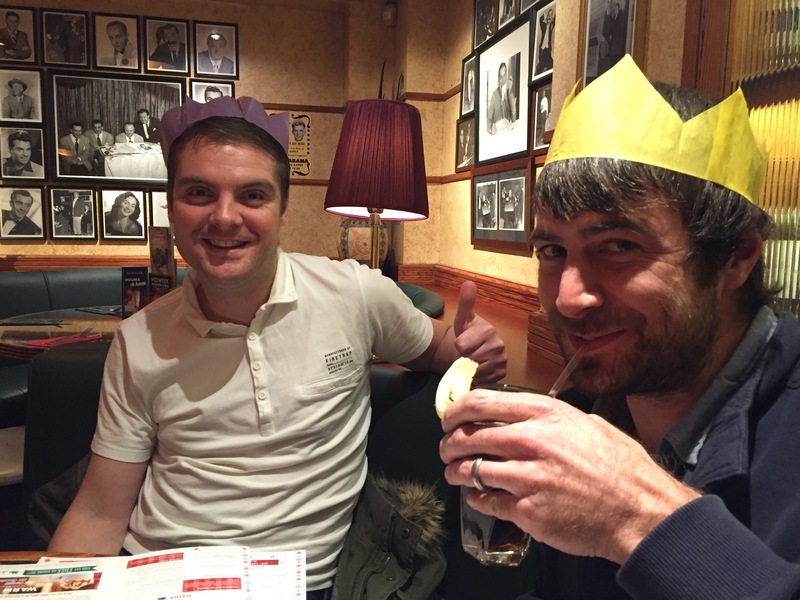 Last week I had my first Christmas dinner of the year… complete with party hats and crackers! Never too early! 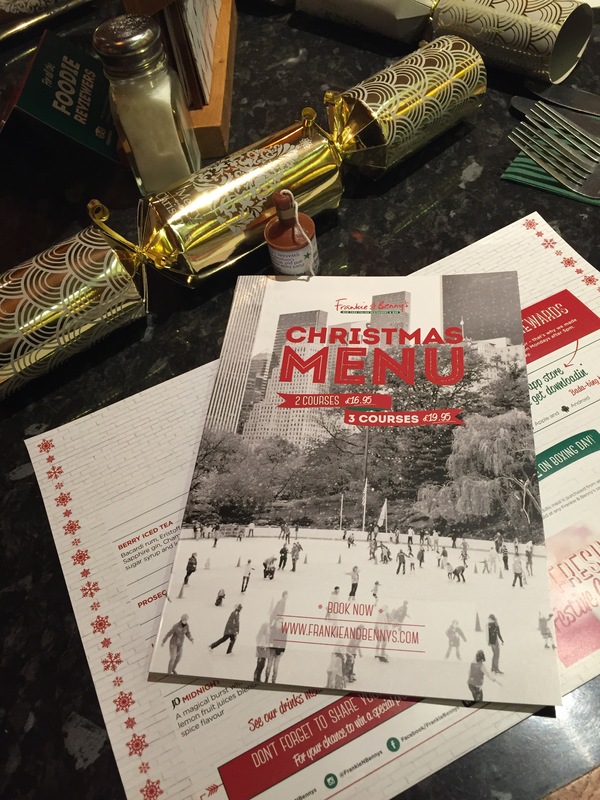 Barry and I headed out with our friends Kieran and Emma-Jane to have a Christmas get-together and to try out the new Frankie & Benny’s festive menu. We met at Victoria Square and were shown the menu which is 2 courses for £16.95 and 3 courses for £19.95. For starters I went for the Mac ‘n’ Cheese cake, because I was really intrigued! It’s traditional mac ‘n’ cheese which has a crispy coating and was served with BBQ sauce and topped with winter coleslaw. I love mac ‘n’ cheese so enjoyed my first course! Barry chose the smoked salmon bruschetta and was delighted to get three ciabatta crostini topped with salmon, lemon soured cream and rocket! Kieran picked the pulled beef salad, while Emma-Jane decided on the Buttermilk Chicken tenders. She really enjoyed the sauce it was served with, which turned out to be their signature salsa verde mayo. All very happy with the starters! For mains I think we were all very tempted by the traditional Christmas dinner! A Christmas party isn’t complete without turkey or chicken right?! But in the end, we all decided to try something different to get a real feel for the menu. Kieran stuck to his guns and went for the Festive Dinner which is half a roast chicken with pigs in blankets, stuffing balls, rosemary roasted potatoes, mixed vegetables and red wine gravy. What can I say about the Christmas dinner! It was huge and I don’t think he managed to finish it! Barry went for his old favourite, the Bacon Cheese burger, which came with a side of chips served up in a brown paper bag as if they were from a traditional chip shop! An interesting touch! 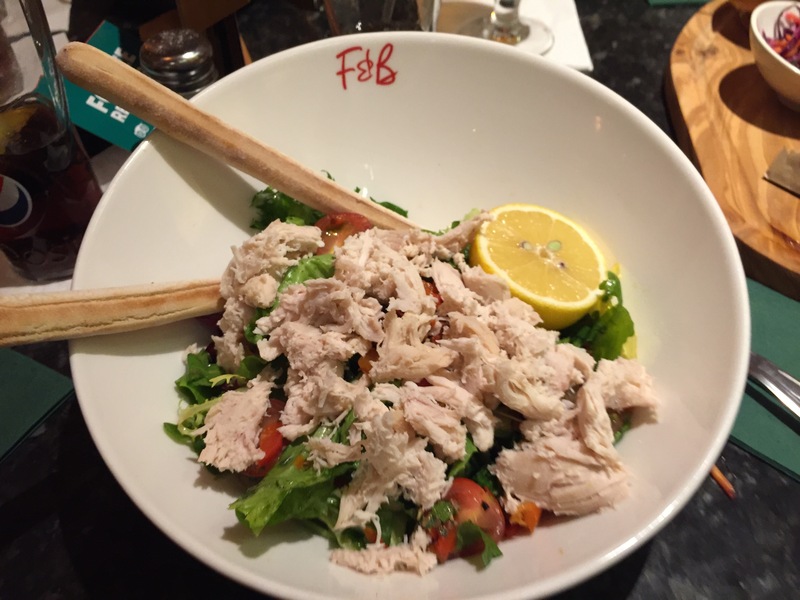 Emma Jane decided upon the Maple flavour glazed gammon and fries, while I picked the dish which intrigued me the most again- the Mojito Salad! I’m not a huge fan of salad but anything that tastes like mojito is good for me! There were lovely flavours of mint, lemon and lime which came through. After all that, we debated if we should go for the third courses. In the end I couldn’t resist! I picked the Peach and Raspberry Pie, while Emma-Jane went for the Christmas fave, the Chocolate Yule log! The sweetness of the peach and the tartness of the raspberries really tickled the taste buds so I’m really glad I had the dessert. It was a great way to end. Our total bill (for two 3-course dinners and two 2-course dinners as well as cocktails, coffees and soft drinks) came to just over £100. We all really enjoyed it and it was great value for an early relaxed Christmas do with friends!